Slice of Life Challenge 2012. Please share the unique URL to your daily slice in the comments of this post. Feel free to grab this button and use it on your blog. Happy slicing. Just a heads-up: If this is the first time you are joining SOLSC, and you’ve never commented before, we will have to moderate your comment. Stacey and I will be checking throughout the day in order to get your links up for the community as soon as possible. As long as you use the same username/email to log in, your comments will appear instantly in the future. Please (pleasepleasepleaseplease) use the SAME email/username information on all of your March entries. This is essential to make tracking your number of slices a little more manageable. We’ll close comments for the previous day’s slice the next morning. As long as you get your slice linked on each daily slice post, you are in the running for prizes. Further information will come later in the month regarding prizes. Any questions, please use the online form to send Stacey an email, or email or tweet me. It’s still Thursday on the west coast. This is my very first slice, but I’ve have loved reading the blog for some time. First Slice of Life Messge ever! Whew! So worried I’d miss Day 1. Glad to be back for a fifth year of slicing, looking forward to catching up with familiar voices and hearing some new ones. Happy March, everyone! Bring it on, SOLSC 2012! Trying blogging for the first time. My first post is about teaching nonfiction in kindergarten. My btf (best teacher friend), my husband and I are joining this challenge. Excited to learn about blogging and making time to write. Here is a first sllice from a newcomer to SOLSC. My first official slice is about a student becoming a reader and a writer, maybe for the first time. Thanks to Tupac’s book of poetry. On a sidenote, I somehow added my name before realizing what I was doing to the 2008 slice site–too funny! I’m trying to link again…. Glad to be joining for my third year of slicing! Good golly, this is a great turn out for the challenge. Last year, I was on the east coast….this year, I’m in the great NW. This time zone thing is hard to manage with this challenge but I’m up to it. Good luck everyone! A post for my birthday! My students and I are so excited about this challenge. It has brought new life to our writing class. I am new to this so not sure it will work – My students and I will be writing all month for the first time. Here is my first writing. Slice # 1- Feels good to be doing this challenge again! I have 48 of my students slicing as well. Here we go for year 2! So excited! Thanks again for hosting. Let it begin! A slice from a day of my life when I was only one! I feel like I am entering the great giveaway of the 21st century….or a chance ot be “queen for the day”…but I will try one more time….and then I will keep trying….even if I get blocked out of day one! I’ve never done anything like this before, but I’m going to try it! My wife is a teacher doing this and her teacher friend is doing it too. I am an artist and father of an 8 year old. Using slice of life to flesh out write with my wife and flesh out my story. I hesitated to join this challenge because life gets so busy and I didn’t want to add one more thing to my already full plate. However, I’m taking the plunge! Here is My Slice, which was inspired by one of yours. I really hope to keep this up, since I blog so sporadically. I enjoy it so much, but forget to do it for myself. So here’s to The Cat in the Hat Day Celebrations across the world tomorrow! This year, I’m going to Go For It! 31 Slices in 31 Days. Off and running SOL 2012! I created a blog just for third graders to link to for their slices. I put my slice up first for an example–all their links are under the comments section. This will be an amazing learning experience for those who continue the challenge. Thanks for letting us all join! Yabba-dabba-do! I am so excited to participate in my first SOLC! What to write for a first slice? How about penguins that make me smile? A snow day for me in upstate NY!!! I teach 7th grade ELA and I’ve offered this challenge to students as well. Today we were in the computer lab, so most of them completed a post. I told them they might have comments from other people. There are SEVERAL slicers here, so don’t feel obligated to comment on tons of student posts. Just an FYI – I had 2 of my girls who completed the entire challenge last year, dust of their blogs and join in again as 8th graders! That was a happy moment for me indeed! It’s time for a yummy dessert! What do you do when you suspect there are ghosts in the basement of your school? Day 1. I am a rookie at SOLS. My Slice of Life—some of my student’s slices of life are in the comments…we’re still working on that! Here is my first post. After teaching for 43 years I wanted to collect stories from those years. A little something about the noise that is spring. Thank you Ruth and Stacey for the inspiration! I was thinking about this community of writers when I wrote this poem tonight. The first of many (hopefully). Sorry, I think that I messed up the last time. I am joining in the fun! I’ve been out of the loop for a while, so I’m glad to be back writing. My first slice. A little thought about trust in education. not sure how exactly to link. one is from the blog post, one is from the whole blog. I have practiced this twice now. The Tuesday slice of life days have helped me build a little courage for this challenge. I hope I am up for the task. Here is SOLC post 1. So excited to finally take part in this challenge-I’ve wanted to do this for 3 years! In the my first blog I share what we did for a professional development workshop on the share session during writer’s workshop. Looking forward to getting back into daily writing and reading others during the slice of life challenge! It’s all about building our writing muscles -increasing stamina and eliminating the potential roadblocks! I blogged here about my special day! I responded on the wrong page, but I am herefinally! Yay! I am looking forward to reading your stories. pamelafernuikhodges, Here is my story. I am overwhelmed by so many slicers! Today, I am in love with Mr. Morris Lessmore! Cooking up my slice of life challenge. I’m glad to be a part of this challenge this year. You all have built a wonderful community of readers and writers! My first March challenge! So excited for every day to be Tuesday! Here’s my first official slice–though you’ll see why I’m calling it #2. I can do this! They say the first slice is the hardest…right? So excited to be engaging in this. I am wondering what writing tomorrow with bring. Here’s the unique url for the March 1 slice — sorry! Back in the writing mode and ready to slice? Ok, here goes my first Slice. I’m exxited but it’s scary stepping out on that limb for the first time, but I’m super motivated! Forcing myself to write small. Here it is! My first slice! Do you have a friend or a mentor that you are thankful for? Someone who helped shape you? Here is a little taste of my journey. Reflecting on the past, how I felt I neglected my child. I am back for another attempt. Wassup with all this new gravatar stuff? I want my old doggie photo back! @T-Dawg: I see a very cute dog’s face while moderating your comment. Not sure why it’s not showing up for you. Hmmm. Glad you’re back! A new adventure for me! I am excited to learn more about myself as a writer and more about my fellow slicers! Day one! AND I FORGOT my blog address. It is a learning process! So…it is a “snow day” here in Maine and I have completed my first blog for the 31 day challenge. I see by all of the responses that we will be a big group…lots of excitement. Thanks to my rockin’ cousin Chandra Lowe for introducing me to this! It’s my first time participating. I’m looking forward to a great month of writing. Enjoying a day off. Great to back in the Slice o’ things! Wow….I was hoping I wouldn’t be late today, but a TON of people already beat me! haha….I guess everyone’s excited about March blogging. Yay!!! 77 Posts by TEN IN THE MORNING?!?!!? UNBELIEVABLE and SO EXCITING! Feeling blessed by this group each year! yay!!! I’m nervous and excited! My first slice. Read about it and why I’m doing this. Wow! What a great start to the month of writing. This will be a second year for me! And I’ve kept up pretty well with the Tuesday SOLs, and added the Poetry Friday and the A to Z challenges to my list of “how to make sure I keep writing” strategies. This has been a fun trip! Thanks so much for hosting this. I love the community that has developed. But now for the challenge at hand! It wasn’t what I’d planned, but then I guess it’s more of a slice of life than a planned one?? I’m looking forward to getting my coffee and settling in on this snowy day to read some great posts! Having difficulties posting on blogger blogs with my wordpress log-in. Is it just me? Thoughts for fixing? Wow! It’s 7:00 a.m. in my time zone and there are already 50 other link. Looks like SOLSC 2012 is off to a great start. I look forward to coming back to read some slices later in the day, but for now, it’s off to get ready for work! A reflective moment. An elusion to the blog’s title. Stacey & Ruth…Can you please delete my previous comment? My URL didn’t copy and paste correctly. It’s the little things that make Literacy Coaching so much fun! Here’s to the SOLC 2012…1st slice of 31! @Jennifer K.: I just deleted it. You’re all set. 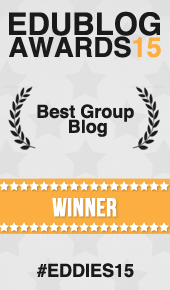 What an amazing group of writers we are – I couldn’t do it without you! Wow – lots of writing! If you share your slice on Twitter, be sure to use the #slice2012 hashtag, too. I am jumping in! Here is my first slice ever! @shaggerspicchu: Please leave a second comment with your unique URL. We’ll need unique URLs to verify that you wrote for prize purposes AND your fellow slicers will need a unique URL to follow so they can read and comment on your posts. Thanks! Here we go! I’m new to the Slice of Life Challenge, and I’m going to get help from my students for topics. Maybe they will slice along with me? Showing my first hour students what I’ll be doing everyday as I slice and link-up! Looks like I’ll be busy reading all your (and my students’) posts tonight! Hi Wanda – Glad to see you’re slicing again. Yea for snow days. (Though I hear it’s pretty bad up in your parts today.) Anyway, please repost your slice with your unique URL so it’s easier for people to find it and comment on it. Thanks. I received your e-mail. It looks like your comment got thrown into our Spam folder. Hopefully that won’t happen again now that I’ve approved your comment. If it does, know that one of us will retrieve it out later in the day. I’m new to the SOLC but it sounds way more fun than trying to do NaNoWriMo from the fall. Great idea! It’s here! Challenges will be ahead, but ready to start. I can’t believe how many have already posted and it’s 6:15 a.m. in my world. Stacy and Ruth, you should be so proud of this. Happy reading and posting! I’m excited to have taken the leap. Thanks for organizing! I’m so excited…year 1, day 1…this is much better so many things. I am with Michelle. Wow! This is exciting to see so many slicers already. Happy March! I’m renewed. Year #2 for me and just as excited! Can’t believe there are 28 slicers already this morning and I’m up early for me @ 5:45 am central. Here it is, my very first post for SOL. Looking forward to getting to know many of you at Two Writing Teachers! So thankful for this challenge to get writing again. I am also having my students start a classroom challenge today. Welcome to March and the promise of Spring! I’ve been “a writer” before, but I frequently fall off the horse. Thanks for the chance to try to get back on. This is my very first slice. One down…. a lifetime to go? My first SOLC, and I can’t wait! Thank you for hosting, and I am thrilled to be a part of this! My blog is still under construction. . . The SOL challenge is finally here~thank you Stacey and Ruth! Happy Slice of Life 2012! I’m hoping I did this correctly. I resolved to blog this year and promptly ignored my resolution. This may be just the thing to get me in the habit of daily writing. Here’s hoping! March is finally here! I am so excited to do the SOLC this year and can hardly wait to get my day started. This is why I teach kindergarten! I wrote this last night, just in case I didn’t get early morning writing time so here it is! March 1st Slice and Year 5 with the Two Writing Teachers Writing Community YES! Wow, 12 already! This is great. I decided to start off with a bang. A post on the power of applause and how recognition for our hard work makes a difference. Here we go! Thanks for getting us writing! I’m taking the plunge again this year! 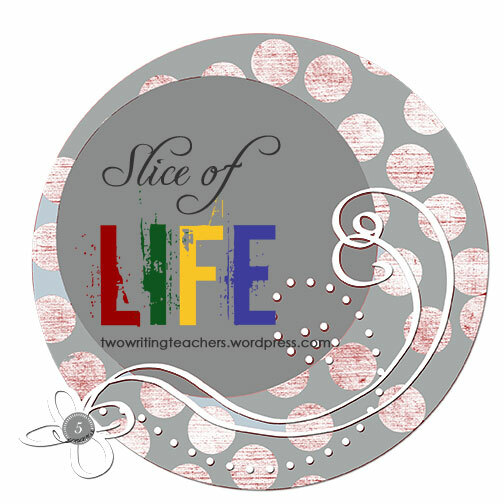 So excited to be a part of “The Slice of Life Challenge 2012.” Looking forward to being a part of the community of writers! Last year I thought of writing just for a month. I’m still writing. Thank you to Ruth and Stacy for the invitation. @Paul: Please leave a second comment with your unique URL. We’ll need unique URLs to verify that you wrote for prize purposes AND your fellow slicers will need a unique URL to follow so they can read and comment on your posts. Thanks! My first slice… Like a piece of chocolate, hmmm! @Christina: Kindly leave another comment with your unique URL. We’ll need unique URLs to verify that you wrote for prize purposes AND your fellow slicers will need a unique URL to follow so they can read and comment on your posts. Thanks! I have never tried this challenge before, but I am excited to get started! I’ve written my first one, and I HOPE I have done it right. Thank you for giving us some incentive (as if we really needed any!) to write. I’m curious to see how this will go for me this month. I hope you enjoy reading! A newbie to SOLC. Afraid my post is a bit long and depressing – but I had to get my thoughts down. Glad to be a part of this community!! Thank you Ruth and Stacey for hosting the SOL Challenge. I’m also in a different time zone. This is about a Indian Education for All – one of my passions. I’m excited to be part of this challenge again!! Here’s a short piece on how sometimes life happens! I actually did plan on staying up to honor my commitment to writing every day for a month. Thanks so much Ruth and Stacey for hosting us. I am so excited to renew a commitment to writing alongside many friends and colleagues. I didn’t intend on staying up for the clock to strike midnight, but here I am. It’s hard to believe what started as a tiny group of people in 2008 has turned into something larger. I’m looking forward to reuniting with long-time Slicers this month and learning more about those of you who are doing this for the first time.